as you now Sunday is a fun day. 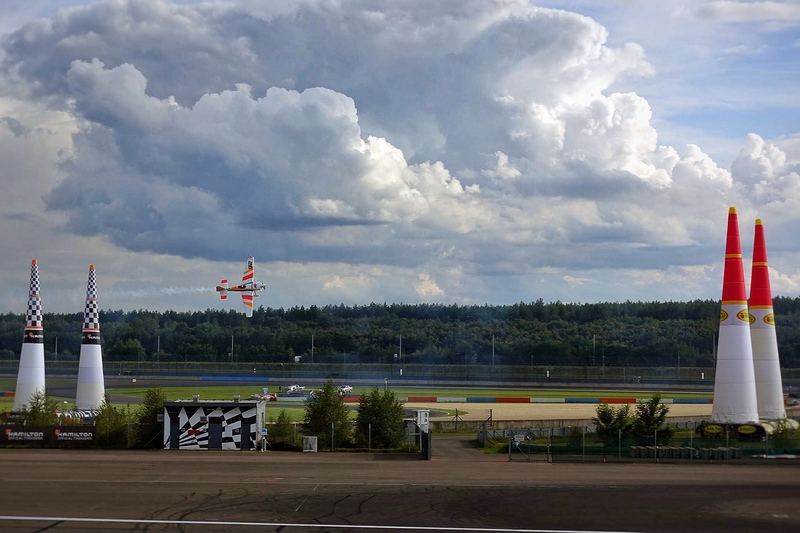 Last weekend I attended my first Red Bull Air Race in Lausitz, Germany. On top, I was also invited to go on my very first aerobatic flight with an Air Race pilot. I spent two exciting and action-packed days. 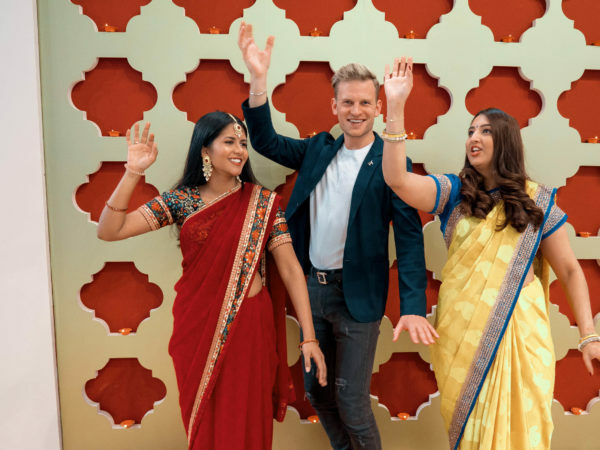 In this blog post, I will share the fun with you. 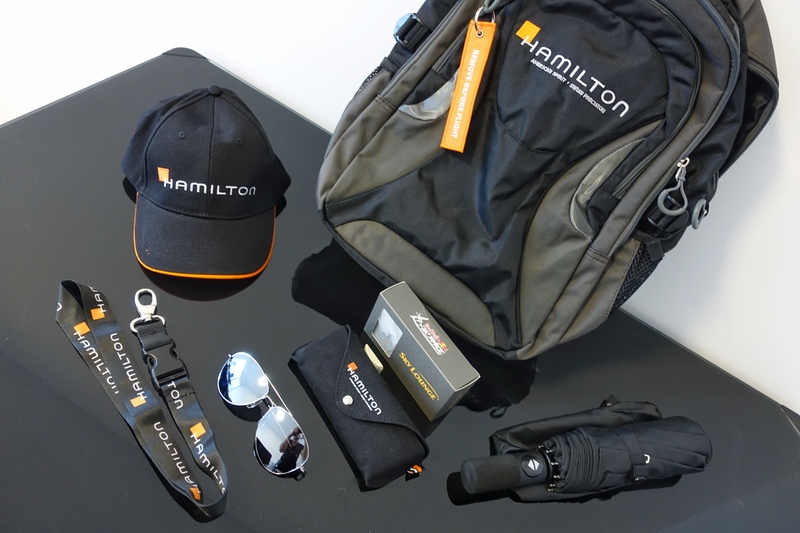 You also have the chance to win a bag back with a lot of useful goodies. I arrived late in Dresden because I had an evening flight from Bergamo back to Germany. After I landed in Leipzig I took a rental car on 1,5 hours drive to Dresden. 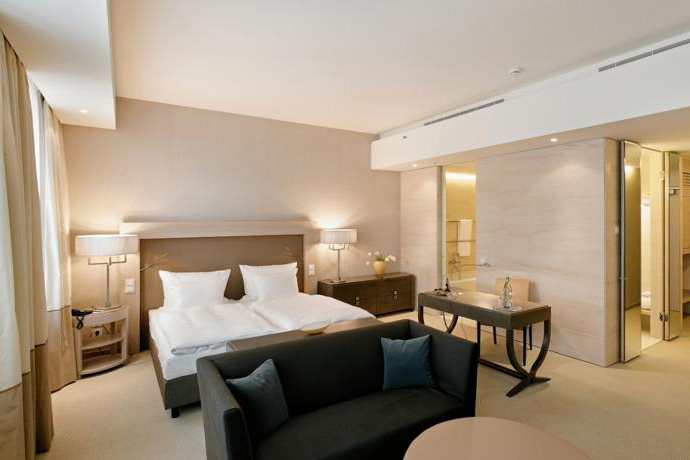 At 1 am in the morning I checked in the Vienna QF Hotel, which is located right in the city center. The next morning I already had to get up at 7 am. The cozy hotel room helped me to have a good, but short rest. After a tasty omelet and smoked salmon for a breakfast, a shuttle picked me up to take me to the venue of the Red Bull Air Race. 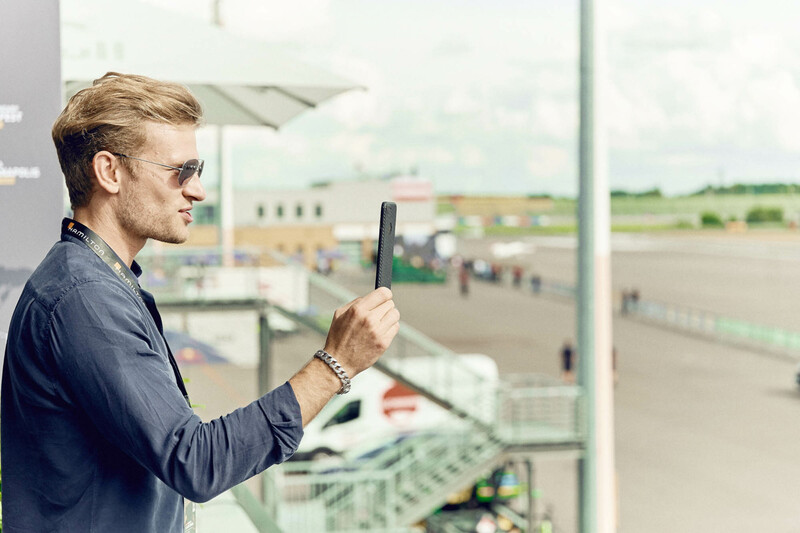 Hamilton watches (The Swatch Group Germany GmbH) invited me to the 7th RedBull Air Race World Championship in Lausitz. 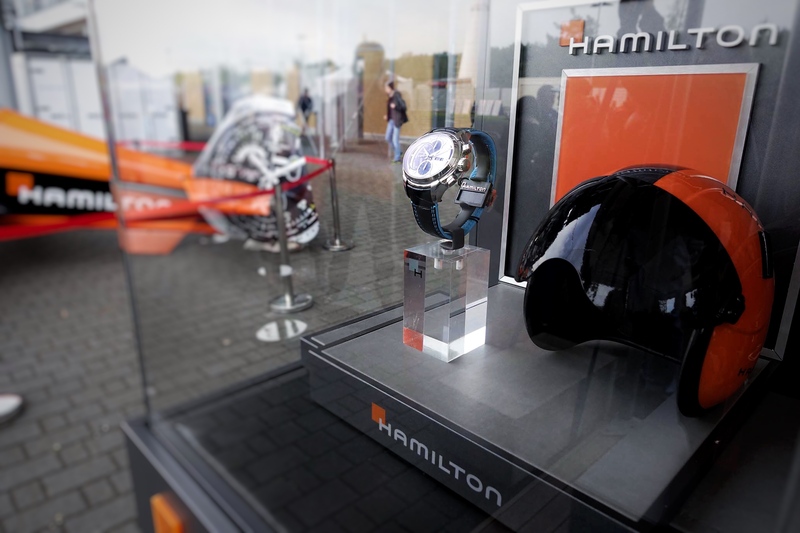 It is the only air race in Germany and Hamilton watches is the official timekeeper of this championship. 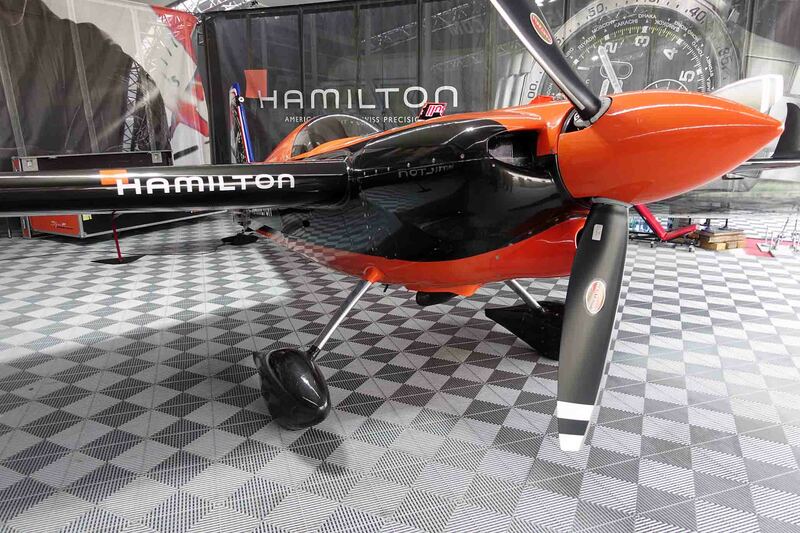 It is a great match because Hamilton is linked to the time keeping in aviation since 1918. Back in the days, pilots had to rely on the precision of their watches for navigation. 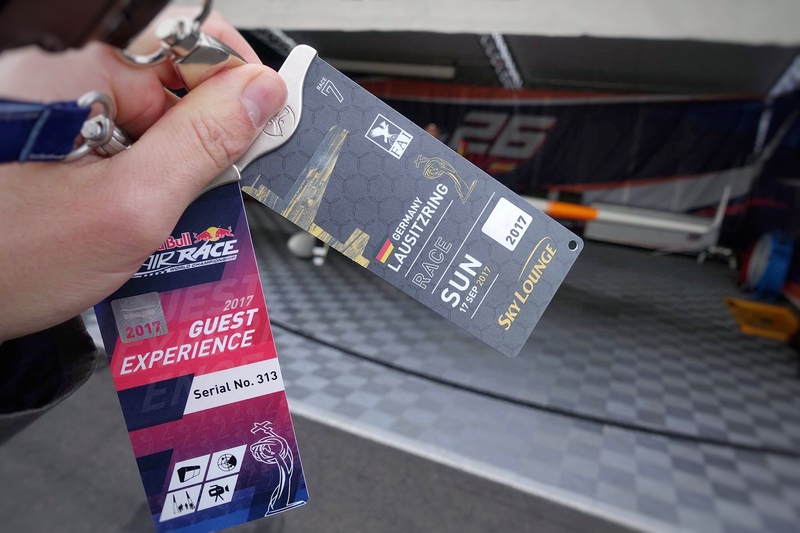 First of all, we were equipped with VIP passes which granted us access to the Sky Lounge. 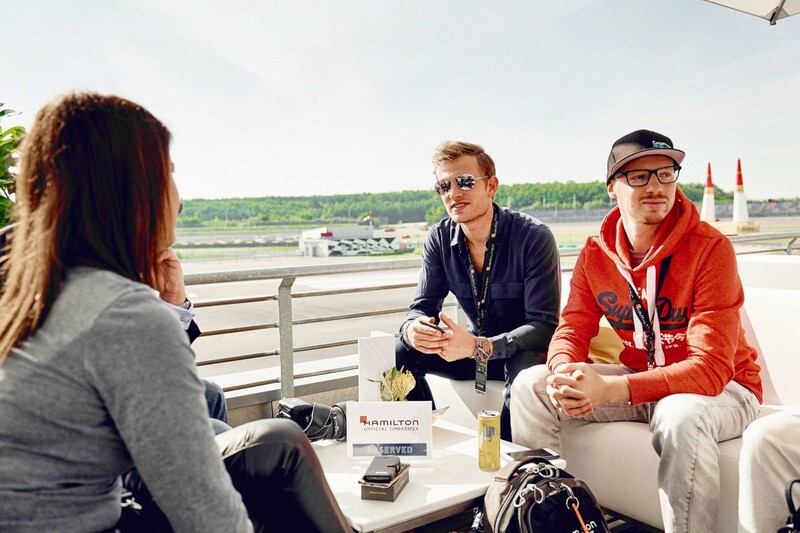 The Hamilton crew consisted of Percy (luxify), Jens (atomlabor), Sebastian (Männer Style) and Basti (Basti_go_pro). Our schedule for the day was filled with a lot of activities. The first item on the agenda was the hangar tour. 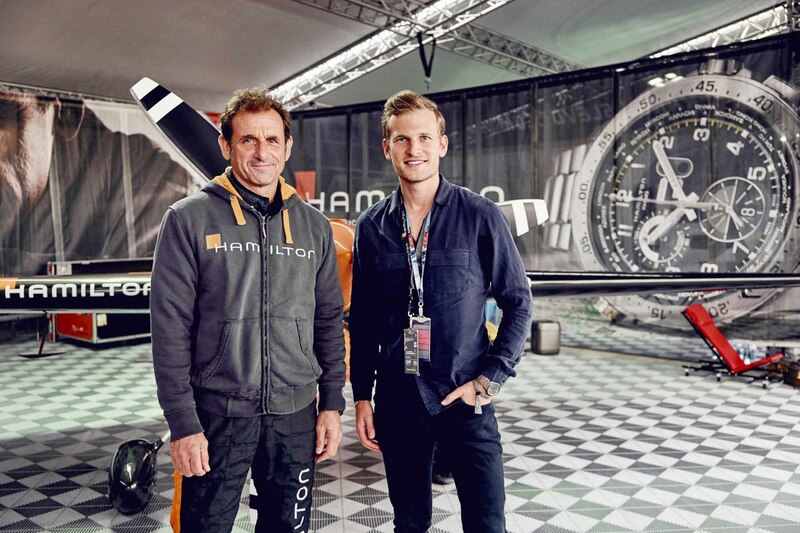 I had the chance to see the racing aircraft up close and I met the pilot Nicolas Ivanoff, who is the brand ambassador of Hamilton watches. We took a photo in front of his aircraft, Zivko Edge 540 and I wished him happy landings for the upcoming race! The weather was perfect. The sun was up and the winds were calm. Ideal conditions for the pilots and the spectators. We enjoyed refreshing drinks in the sky lounge, which granted us the best view of the race track. The runway was situated right in front of the terrace, so the aircraft were taking off and landing up close. The area was exclusively for VIP guests. 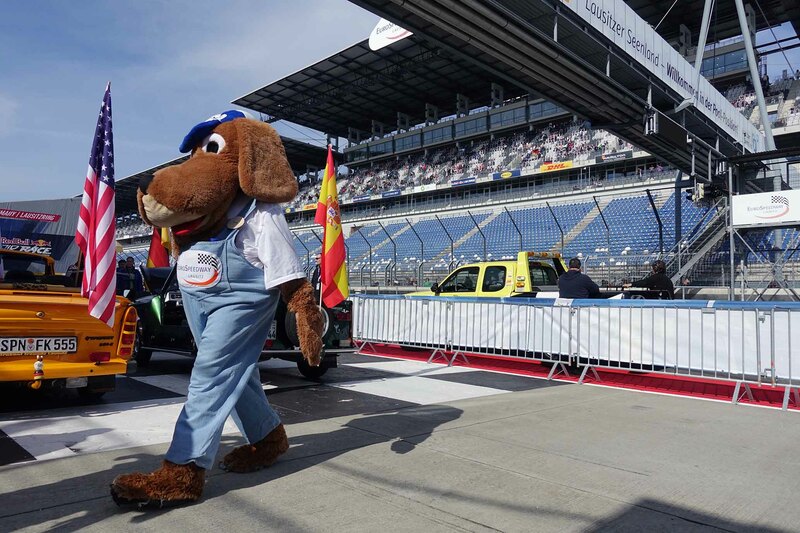 I almost forgot to enjoy the catering because of the action on the race track and the fun in the lounge. 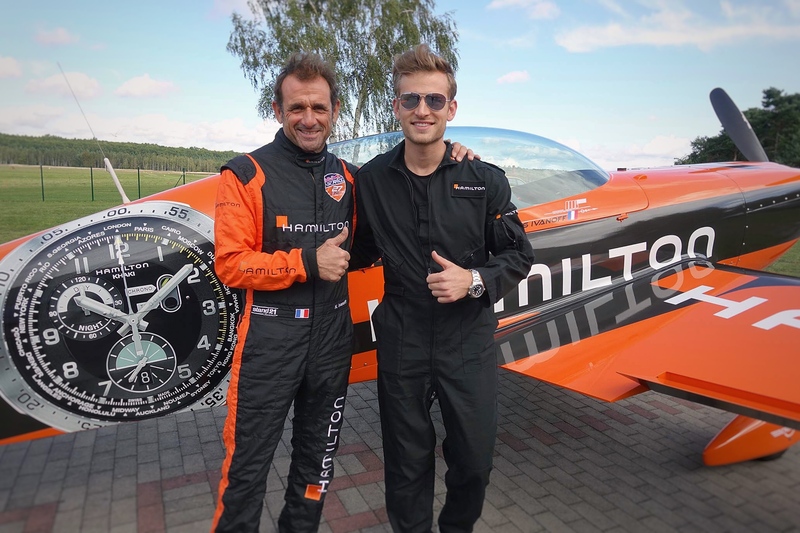 The first flight battle was between Nicolas Ivanoff and Martin Sonka. It was the first time for me to watch an air race live. Even as a pilot I was impressed by the speed and the maneuvers the air race pilot flew. It is a combination of skills, precision, and speed to succeed in this competition. One round consist of two laps through the course of pylons. Nicolas controlled his aircraft flawlessly through the tight race track. But unfortunately, his competitor Sonka was a little bit faster. The pilots pull unbelievingly up to 10 g and fly speeds up to 370 km/h in the race track. In a thrilling roller coaster, you might experience around 4 g. 10 g means 10 times your body weight. Amazing what the structure of the aircraft and their pilots have to withstand. I was wondering what the feeling was like to be on board of such a flight. Luckily I was going to find out the next day. 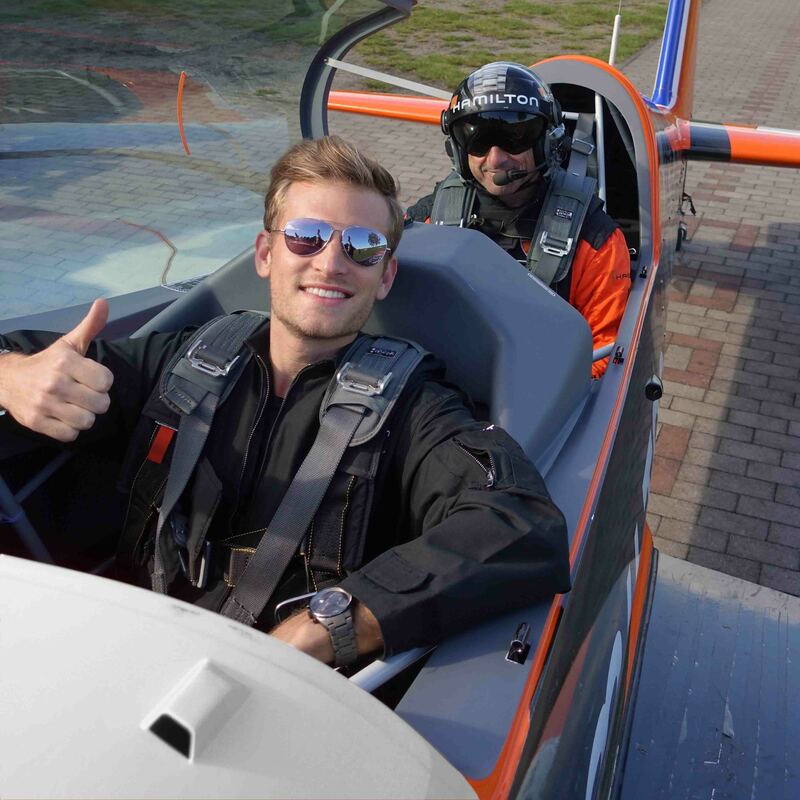 The next day Nicolas Ivanoff and Hamilton invited me on an aerobatic flight in an Extra 330 LX at the aircraft Schwarzweide-Schipkau. 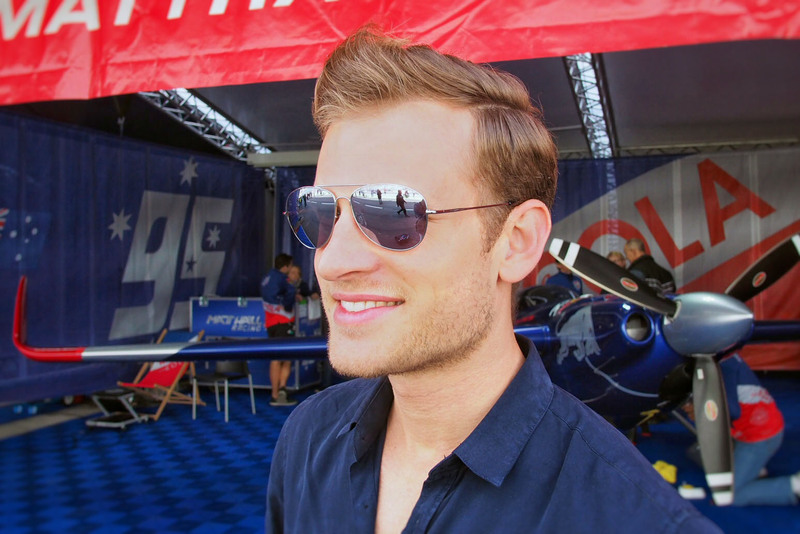 Ivanoff is the leading French aerobatic pilot and an expert in creativity when it comes to his flying skills and techniques. During my flight training, I flew step turns of 60° bank angle. This was the most aerobatic maneuver I have flown. Many of my Aviators asked me before the flight if I am nervous or scared to go on this flight. Anything but that. I was super excited to discover a new way of flying. I told Ivanoff that he can fly the full program with me and that I am not scared a single bit. He really did and it was amazing. I could not stop smiling. It was really a thrilling flight. All roller coasters are boring compared to this flight. Ivanoff flew countless barrel rolls, loopings, spins, vertical flight maneuvers. He pulled 8 g followed by the maximum roll rate of 400° a second. Once I blacked out for a very short time. In the end, I took over the controls and I flew to barrel rolls myself. It was an exceptional feeling. Watch the video. It says more than 1000 words. When you think about cities in Germany you won’t necessarily think about Dresden. But it is definitely a highlight you should not miss out. Especially the city center, which was completely destroyed after the second world war, was beautifully restored. Winner of the A380 model giveaway of the blog post about aviation myths is Maurice. 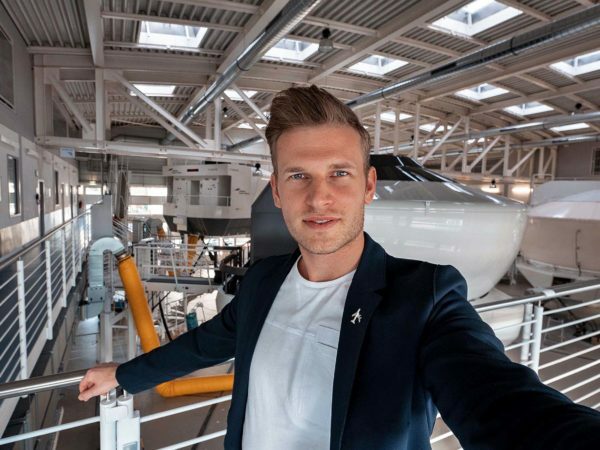 Hallo Patrick! Aus deiner Erzählung kann man lesen, dass es ein einzigartiges und einmaliges Erlebnis für dich war. Ich sehe mir sowas gerne an, aber ich hätte nicht den Mut dazu und würde mich nicht trauen, in so einen Flieger einzusteigen und mitzufliegen. Hallo Sandra, danke für Dein Kommentar. Es war wirklich wahnsinnig tolles Erlebnis. Ich denke im Moment daran eine Kunstfluglizenz zu machen dann gibt es bald noch mehr solche Videos 😉 Happy landings! Awesome! Thanks for your comment. It is an amazing experience Always happy landings! Would I ever go on an acrobatic flight? I would definitely say yes but I would perhaps be nervous but excited at the same time. Maybe I would be nervous about blacking out like you did for a few seconds but I would also probably have a smile on my face the entire time. I’m sure it was a thrilling ride!! Would I dare to go on an aerobatic flight? Yes, because I love discovering new things and do everything what is very extreme. Like me! 🙂 Thanks for your comment. Always happy landings! You don’t have to ask me one more time !!! I would love to take a flight with that “bird”!! Oh !! The video is freakin’ cool!! It looks amazing and adrenaline!! 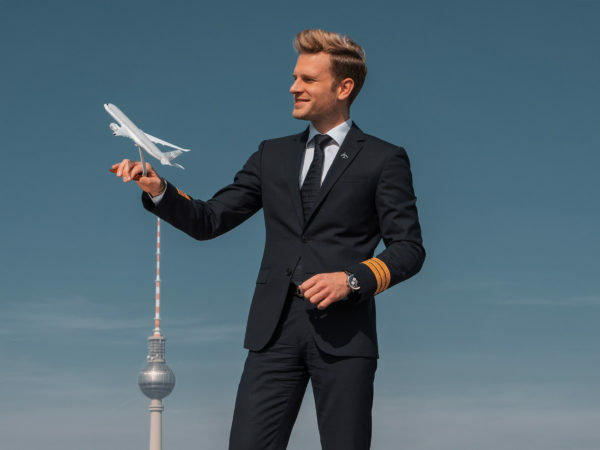 Hello Pilot Patrick i hope you are having a good day!! Yes ofcourse I would like to go on a aerobatic flight ! Its a great experience i am sure ! I saw you enjoying it ! And as a ATPL student i would like to see the aviation wild side ! Thank you for your posts ! We are waiting for more ! OMG!!! It was so amazing, I could feel the experience even though I wasn’t there! So, if I dare? FOR SURE!!! Hello Pilot Patrick. I like this article. I like a challenge. I think now woman n man have no different for having many experience. If I have a chance to do aerobatic flight, I think I dare to try it. Although I never fly before, at least I dont need to swim, haha. Thanks for sharing your experience. 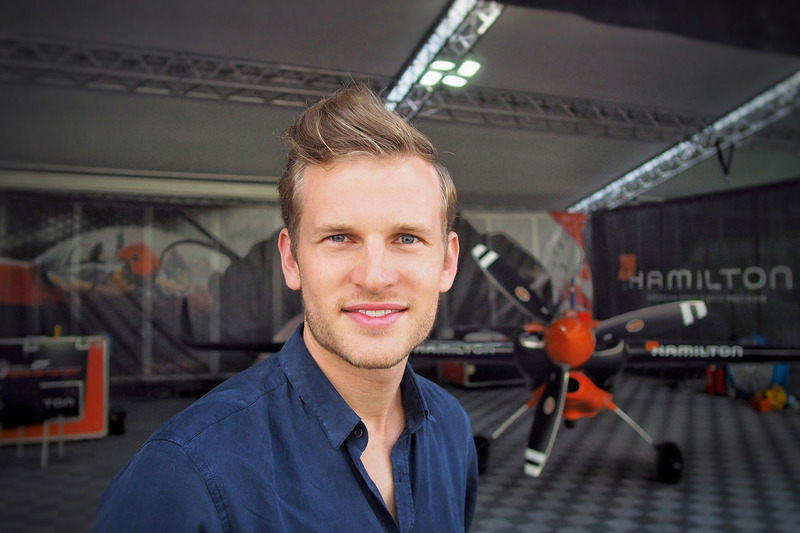 Hello Patrick from Greece!I would like to have an aerobatic flight but i’m very tall (1,92cms)and perhaps this is a problem.That ”bird”is very small.I’m jealous of you!Your blog and your posts are great! I follow on instagram,your page is awesome.We are waiting for more posts!!! thanks for your comment. I think your hight is not a problem. I am 1,86 m I I still had plenty of space left. I am looking forward to sharing. Happy landings! Yes I would dare to take an Aerobotic flight all because it is Avaition and I love everything that has to do with Avaition . Hello Andrews, thanks for your comment. you are absolutely right! Aviation offer so much! Woah I would love doing that…………Cos the hypnotising scenic beauty from top as well as the blue sky would let me take that risk……I would love doing that……..It is always said to do get the best we have to take the risk……. Hello Clerance, nice name by the way! 😉 Well said and thanks for your comment. Yes I would like to experience that! It’s extraordinary and I think I can see the beautiful scenery from a different angle, not only sit around an commercial airplane and see it trough my window (even though sometimes I don’t get a chance to sit next to the window ☹️). Hello Osi, thanks for your comment. It was an amazing experience and totally different than a flight on a big aircraft! I hope you have the chance someday. Gutentag Patrick, hello from Belgium! I would really love to go on an areobatic flight with a powered airplane, I’ve done a few areobatic flights with gliders a year ago. Even during my Glider Pilot License exam: we did 4 loopings in a row 😉 ! I subscribed and Keep up the nice content! Cheers! Without hesitation I would dare to go on an aerobatic flight! Aleksi, thanks for your comment. You would definitely enjoy it! It will be my first time and I will probably be screaming alot, but it will be wonder and alot of fun! First time up in the sky!!!!! thanks for your comment. It was a lot of fun and a different way of flying. HELL YEAH !! What parking stand is the aerobatic plane on and where is my boarding pass?! Once you have tasted flying, you can’t live without !! Hello Vincent. Nice quote. I think I should get a aerobatic licence and then I can take you on a flight 😉 Happy landings! We should do it together! And to be honest, i am looking to get an Accelerated Free Fall license! Have you been skydiving before?! You should do it as well, especially after your acro flight! You’re a great pilot (At least it looks like that). What’s really great to see, is that you can really see how lucky you are in an airplane. I have 1 question for you: Were die you get educated? And do you recommend it? If so, why? Hey Ana, it was so much fun so you would have enjoyed it. thanks for your comment happy landings! Hello Caroline, good answer! Well said. you are so right! Hello! I don’t know if I would dare, I think so. One question, were you nervous before the flight? Hello Hocine, great you are an Aviator! That makes me happy to hear. you should try it out if you have the chance. It was indeed a thrilling flight! If you have the chance I would definitely try it out! Yes you are right! Would you dare to go on an aerobatic flight? Hello Patrick 🙂 Good answer!! hehe thanks! awesome!! you would enjoy it. Would I dare to go on an aerobatic flight? Yes!!! Eric, good answer. Do it if you have the chance! YES! I have never been afraid of flying and recently I found out that aviation is kind of my passion. thanks for your comment! It is a passion! Thanks for being an Aviator! Hallo again, I forgot to ask how it felt when you blacked out for those few seconds? What do you remember?